The rated hours before re-build of the upper end is about 10,000 hours and this engine has 1,225 hours after that rebuild. The rated hours for the lower end re-build is every 20,000 hours so that re-build has not yet taken place. The seller has a complete spare second engine (Cat D 399) which is available for an additional $75,000. The main engine is air start. There are two air compressors both 10 hp. One is a Quincy 325 and the other is Ingersol Rand. 12 volt, 4 batteries charged by: generator There are three diesel powered generators. There is no holding tank because this boat has a MSD Micro-Phor overboard system. 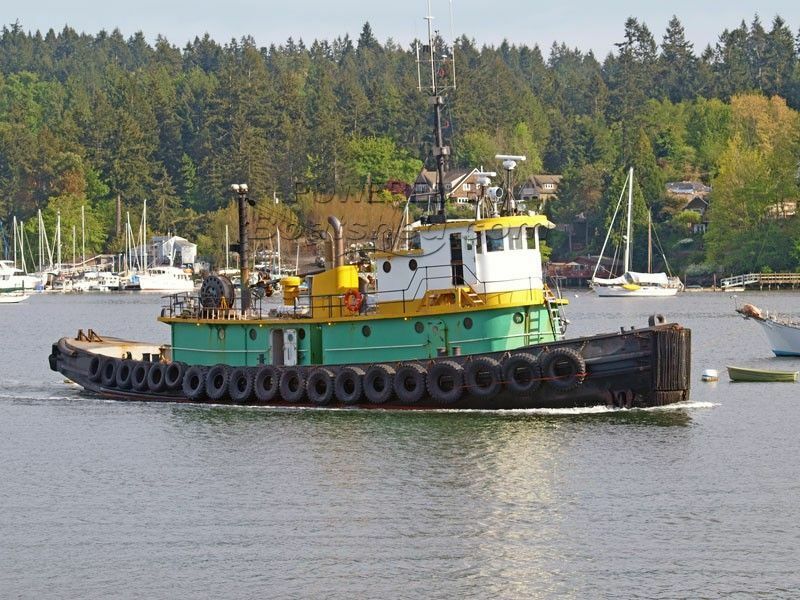 This 100' Steel Coastal Tug was built for the navy and is designated YTB 387. It is of the Bushey design as specified for the Navy. It was built in 1944 but went into storage in Bremerton WA until going into service in 1974. Waterline Boats / Boatshed does not independently verify dimensions and capacities, which are reported from literature and/or seller's information. This is a working tug in every respect. It is currently working moving a log barge in BC. It has a long and successful history of service including open ocean coastal travel. The pilot house has modern electronics and controls as well as a private double cabin for the captain. There is a passageway down to the galley dining saloon. This area is equipped with two full-size refrigerators. One operates on 120 volts and the other on 12 volts. There is a large galley table with ample seating for the crew. It is a great "off watch " area. There is a pantry aft and to the port with a passage way to the engine room. Also there are door ways port and starboard to the side decks. Uniden LTD 715 VHF "
Fire Kidde Fire Alarm system with three location sensors. There are two on-deck helm stations. There are three gas driven pumps for emergency fire or dewatering the bilge. Also there is a fire alarm for three areas of the boat, two sensors are in the engine room and one in the galley. This Steel Coastal Tug was originally built for the U.S. Navy to their specifications. It has been modified in the way of the engine controls, the electronics, main engine, the drum winch on the aft deck, generators, and air compressors to name some of the major components. There have been minor changes to doorways and passages. This tug was stored as USN surplus from 1944 to 1974 and has been in continual commercial operation since 1974. She has been upgraded as necessary to remain economical and commercially viable. Current as of 2018 this Tug has gone through a major renovation including a more powerful main engine. At sea trial she made 12 kn. This tug could continue commercial work for the next owner or could become a great live-aboard coastal cruiser for many NW adventures. Her air-operated control systems would allow operation by a small crew -- even a couple. Should the next owner not be interested in commercial use the seller is willing to remove some of the heavy deck gear (the huge drum winch on the aft deck for instance). The seller is also willing to make moorage available while the new owner finds space of his or her own. Currently this vessel is in the process of completing a 4,300 mile journey. This Steel Bushey Navy Tug 100' Commercial Seagoing Workboat has been personally photographed and viewed by David Carleson of Boatshed Seattle. Click here for contact details.